While hiking across the Smokey Mountains on the Appalachian Trail in April 1994, I ran into my first real experience with thru-hikers. I've been around long distance hikers for years, while I was hiking 100+ mile trips, but I normally let them do thier hike, but in the SMNP that is impossible due to agenda and limited camping requiring the use of the shelter system on the AT. After saying good-bye to my wife at the Fontana Dam Parking Lot, I started the long, slow 5 mile climb up to Birch Spring Shelter (now Birch Spring Campsite). It was on this day that a group of thru-hikers adopted me on thier first day back on the AT after taking a day off in town to rest and re-supply and would eventually give me my trail name, Chef Paul. Now since your scatching your head and asking yourself,"what does this have to do with food"? Everything. 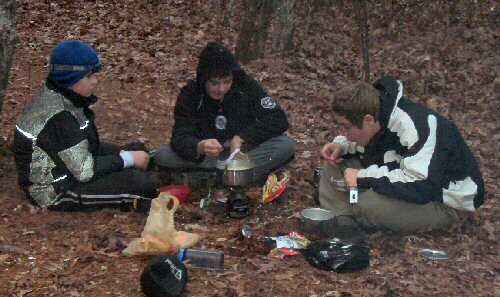 After we got to the shelter and picked out our places to sleep, it was time to prepare supper and eat. Everyone found a level spot for thier stoves and started to cook thier meals which mainly consisted of noodles, noodles, and a course, more noodles. I looked around at thier menu of choice and quickly found a corner to set up and cook also; it didn't take long for my supper to draw my new found friends attention. As soon a my pan hit the stove, I knew I was in for it. Thier noses started to notice a odor from thier memory. One of them said,"something smells good". Another said as he scoped the area,"It smells like meat". Finally one of them said,"It smells like a steak! ", as his eyes made contact with me as I was cooking. "Hey, Paul. What are cooking over there? ", one of them asked. "What kind of supper? ", was the next enquiry. I answered,"just a filet migion,wrapped with bacon with mash potatoes and gravy". "Dudes, Paul's cookin' a steak dinner over here!!!!" There's nothing like hiking solo, eating your first meal on the trail with 22 eye balls staring at your dinner. Since I had thier undivided attention, I asked them a question. "Didn"t any of you bring some hotdogs or something fresh to eat on your first night back on the Trail?" They looked at me dumb-founded; they had forgotten that you could take with you fresh, non-instant food for your first dinner on the trail. Thus the beginning of Chef Paul, and the obligation to live up to the honor of being given a trail name. This page will carry information on food to take, planning and recipes as time goes. Feel free to send a recipe for us review and post. Make them simple, but tasty, keeping in mind spices and items used should be capable of becoming a standard piece in a light weight backpacking set up.